Posted: February 21, 2013 by Jackie R.
Big Brown Bat – image courtesy of USFWS via Flickr. Recently, I embarked on an after-school hike at Caledonia State Park. Despite the below freezing temperatures the previous day, the thermometer held steady at 65 degrees. Tiny remnants of ice lay sporadically throughout the trail, but otherwise Mother Nature provided no indication that winter happens to be the current season. These woods gave an impression of a cool summer evening, just after a steady rain; not the end of January. The forest floor erupted as the bright sun poked through the clouds, and I almost expected to see a red/orange colored whitetail and her fawn emerge from the brush along the trail. Instead, I witnessed a peculiar creature bouncing through the air ahead of us. Hurriedly flapping its wings, it navigated above our heads, appearing to be in a rush, but going nowhere. There was no mistaking its distinctive flight. A large bat was flying before my eyes…on January 28th. For a moment a summer sensation crept into my mind, but then a wave of disappointment overtook me. I could think of only one reason why this should-be-hibernating bat is currently active: white-nose syndrome, which has claimed the lives of millions, has struck yet another individual. Disturbing their natural winter coma the disease causes bats to emerge from their hibernacula too early, and therefore the mammals exhaust necessary fat reserves or freeze to death. I arrived home disappointed that the only creature I observed, was more than likely diseased. However, I researched this rare occurrence and found that it is actually not so rare. Bats are known to become active during warm spells of winter in order to search for a quick snack. 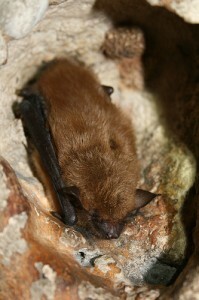 In fact Big Brown Bats are the most likely species to venture out of their hibernaculum in the winter. So, for the future of conservation and the sake of the wildlife resource, I hope the bat voluntarily awakened from hibernation to take advantage of the abnormally warm temperature. I pray it is resistant to WNS and serves as a symbol of hope for the future of these furry winged mammals.